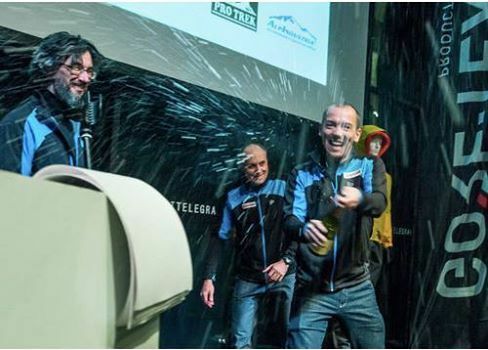 The Russian team of Dmitry Golovchenko, Dmitry Grigoriev and Sergey Nilov recently received a "Russian Golden Axe"—the Russian version of France's Piolet d'Or—for their first ascent of a route they named Moveable Feast (ED2: M7 WI5 5c A3, 1400m) on the north buttress of Thalay Sagar (6904m) in the Indian Himalaya this last September. They climbed the route in alpine style without a portaledge, starting September 9, summiting September 17, and returning to camp September 19. 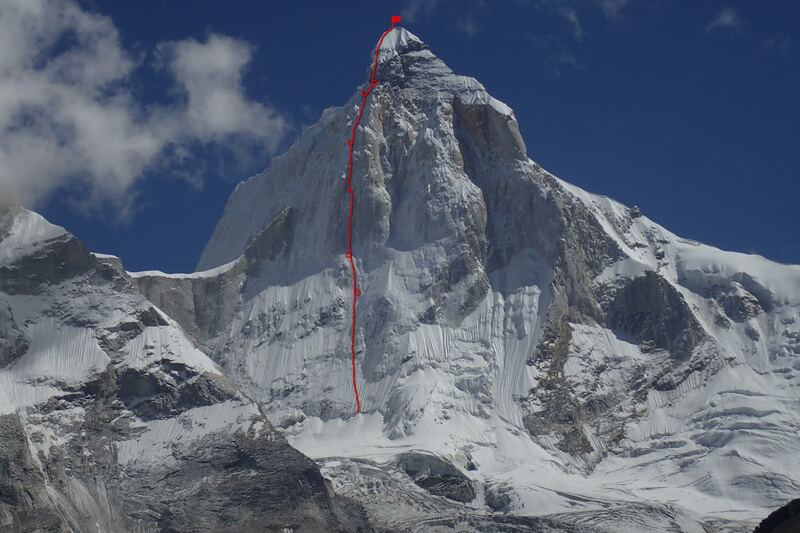 The red line marks the route and camps of Moveable Feast (ED2: M7 WI5 5c A3, 1400m) on Thalay Sagar (6904m), India. [Photo] Courtesy of Dmitry Golovchenko and Mountain.RU. "As far as I know, nobody has ever climbed north face of Thalay Sagar without using a portaledge," Golovchenko wrote on Mountain.Ru. "We [Golovchenko and Nilov]...ceased using a portaledge after No Fear (6b+ A3, 900m) on Trango [Tower in 2011]. It was a sort of [an] extra challenge for us this time—try to make it with a tent for two persons." 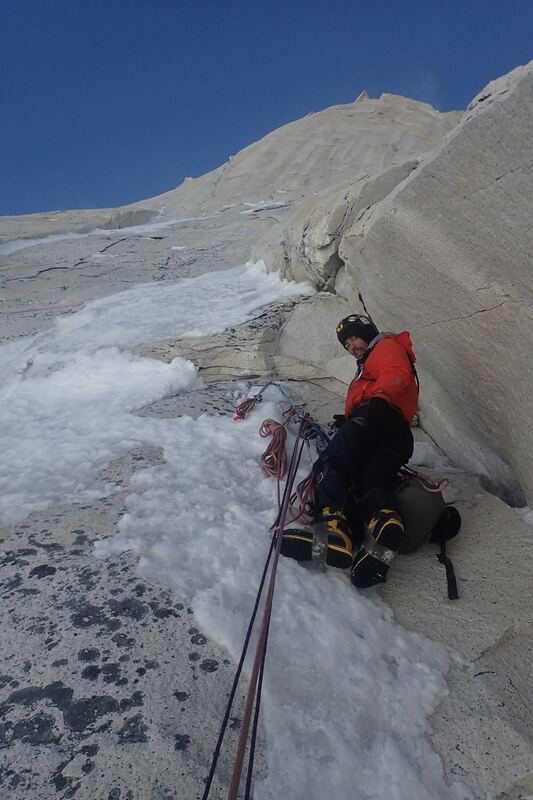 By using a tent instead of a portaledge, the climbers' bivy options were very limited on the long, steep wall. Regarding the portaledge, Golovchenko told Alpinist, through Anna Piunova, editor of Mountain.RU: "Less weight to carry is probably the first motive. But during our preparation I read that there were no ascents on [Thalay Sagar's] North Face without a portaledge, and this became our second motivation, we knew we [could] do it.... We are not against the portaledge. But we would like to minimize using it. Thus we will use it only in case we do not have another option." Thalay Sagar was their backup choice. "Our original option was Jannu (7710m) [in Nepal]," Golovchenko told Alpinist through Piunova. "But it turned out that we [hadn't found] enough money and had to change our plans." [Photo] Courtesy of Dmitry Golovchenko and Mountain.RU. Golovchenko wrote on Mountain.RU: "When I first examined Thalay Sagar I was pretty sure that the buttress left from the central [couloir] [had] been climbed. But then Lindsay Griffin sent me a picture showing all lines, and it turned out that it has been climbed only in part, surprisingly! The decision didn't take too long. "Our route starts from a crevasse, between ice and rock," Golovchenko continued. 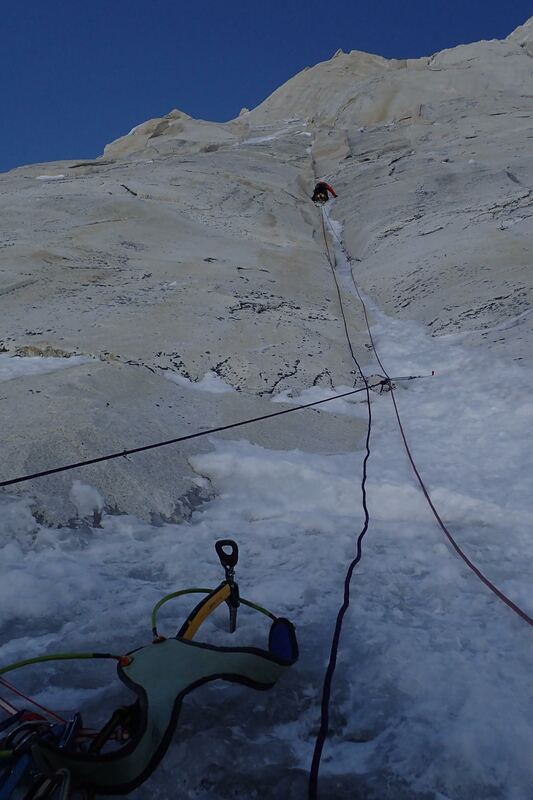 "The first 500 to 600 meters climb a steep slope of ice and snow. Then you deal with the first bastion, vertical rock with sets of cracks all filled with ice. It took us two days to climb 200 meters. Due to the wind and weather conditions even the vertical sections were covered in snow and ice. And if you see rock, it most probably means that it is both steep and smooth. Farther up, mixed climbing begins up the 300- to 400-meter-high, 70- to 80-degree rock barrier. One of the ledges for our tent was under the overhanging rock (we had to chop some ice to build it), and we found some equipment there: ropes and some aid climbing gear. We assume it was left by the 1994 Italian expedition.... [The next pitch] leads to the summit bastion: black and quite loose rock, overhanging at 110 degrees. We tried to bypass this; however, we were unsuccessful and eventually decided to climb it straight up. After the bastion, the final section starts, and a snow slope leads you straight to the summit. Here we took some pictures, and later we found some Indian fixed ropes and used them for the descent." All three men have won awards before. In 2012 Golovchenko, Nilov and Alexander Lange won a Russian Golden Axe, and also, in 2013, a French Piolet for their route Think Twice (ED: 6a A2 M6, 3400m) on Muztagh Tower (7284m) in Pakistan. In 2015 Golovchenko, Grigoriev and Nilov won a Golden Axe for the first ascent of a peak they named Sedoy Strazh (5481m) in Kyrgyzstan, by a route they called Devjaty Val (ED: 6c WI5 M6 A2, 1230m). "The main leader of the team's expeditions has been Sergey Nilov," Piunova said. "He is a passionate climber, but he's not very talkative, not a media-man at all, and prefers to be in shadow—he doesn't even have an email address." The Russian and French awards have many similarities, but there is dispute about whether or not only a certain style of climbing should be recognized. The French award is generally restricted to alpine style ascents, while the Russians don't preclude climbs that utilize other techniques, such as siege tactics, from being considered. "We [Russians] believe that the Golden Axe Award is related to the Piolets d'Or but the French do not," Piunova said. "The problem is not only in using the same name, but the conception of Russian PDO is slightly different from the French PDO. For example, the very first Russian PDO was awarded to the first ascent of K2's Russian Direct on the West Face in 2007, made by a big team in old-school expedition style [fifteen members using siege tactics to establish a route directly up the west face of the 8611-meter peak], which is absolutely unacceptable for the French vision of the award. Until now, we've had a significant difference between the Russian PDO conception and the French one, which makes the group fusion impossible."